For one of the most peculiar walks in London, head to the western edge of the capital. That's the very western edge, as far west as you can go, in a nomansland just beyond the end of Heathrow's runway. Normally the authorities don't like you walking right up close to the perimeter of a international airport, this for reasons of safety and security. But a broad strip of open land exists between the M25 and Terminal 5, somehow with public access, where you can be divebombed by whatever giant plane is taking off for foreign climes. And I stumbled into it completely by accident. Let's get the geography sorted first, starting from Heathrow Terminal 5. To the west of that is a bus station, a hotel and a swirl of access roads, then the airport's Western Perimeter Road. That's followed by not one but two rivers, the Duke of Northumberland's and the Longford. Both were diverted when Terminal 5 was built, and both also provide a passive security perimeter, a useful means of keeping pedestrians out. Stanwell Moor Road is next, linking the northern and southern edges of Heathrow, across which a recent motorway spur emerges. There then follows the strip of land we're interested in, an undeveloped swathe of rough meadow no more than half a mile wide, on either side of the River Colne. And that's followed by the M25, just to the north of Junction 14, along the edge of which London suddenly becomes Slough. I'd been precisely here before, back in 2009, with a report from the roundabout that's the westernmost point in London. Grim, I think would sum the place up, not least the litter-strewn thicket at its centre. I hoped never to come back, but Saturday found me in the village of Stanwell Moor attempting to escape. It's a strange place Stanwell Moor, a few cut-off streets with a number of rivers threading through. 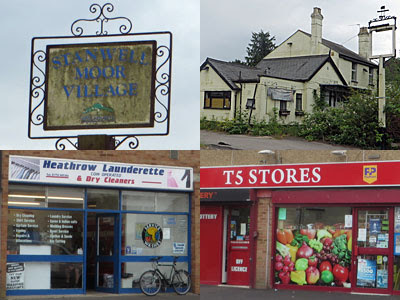 The main shopping parade (such as it is) features the T5 Stores and the Heathrow Launderette, and a fat boy sits on the swings by the village hall haranguing random passers-by (although he may have been a one-off). It also now has a rotten bus service, the 441 having recently been diverted elsewhere. And I couldn't walk to Terminal 5, because that's not allowed, so headed instead to what Citymapper told me was the nearest Oyster-enabled bus stop, a mile and half north on the Bath Road. There are no public footpaths or accessible roads to the north of Stanwell Moor, which was a pain. But a map on my phone suggested there was a mysterious path, or track, or something, wiggling up the side of the M25, so I thought I'd risk it. This first required returning to the very western roundabout I'd hoped to avoid, crossing the boundary back into London in the process. I left the main road into unkempt undergrowth, stepped past a pile of dumped clothes in boxes and headed cautiously through a concrete subway. 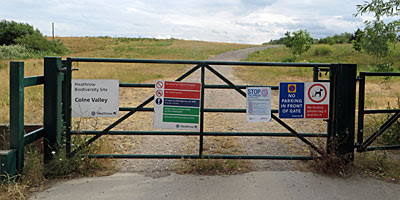 And here I found a gated entrance, not quite welcoming, to an area called the Heathrow Biodiversity Site. Access seemed possible, indeed there were just enough signals that this probably wouldn't be trespass, so I continued through the trees. The track opened out onto a lush rolling slope, once a gravel pit, hemmed in between the motorway and an unseen stream. This was the River Colne, lost as a line of reeds amid a weave of white and yellow wild flowers. In the near distance, beyond further open country, stood the long silver shed of Terminal 5 with its Control Tower to one side. And every minute or so another plane shot up off the northern runway, sometimes small and buzzy, sometimes huge and booming. Annoyingly, never the latter when I had my camera trained on the terminal roof. The footpath curved round to join up with another track from the J14 roundabout, this gated and locked, which was odd because OpenStreetMap had suggested this should be open and the path I'd just followed was barred. Thankfully the path beneath the M25 motorway spur was still clear, passing a stilted concrete lagoon where the waters of the Colne inelegantly pooled. Beyond the viaduct the planes drew closer. I'd reached a point half a mile from the end of the northern runway, a seemingly insignificant distance but enough for pilots to have started to turn in readiness for the first stage of their flight. This meant there was by now no one line of ascent, more a curving fan of possibilities, with a slight deviation all it would take to drive an aeroplane overhead. The footpath headed up a particularly prominent ridge just as one such monster appeared above the trees. The British Airways A380 seemed almost low enough to touch, booming low across the meadow, and I wished I'd been thirty seconds further ahead to have been directly beneath the fuselage. I suspect you can get a similar sensation on the roadside near Hatton Cross, but this was all the more surreal for being in a pseudo-rural setting. And so isolated. Nobody else was out enjoying the HBS, which given that it links the almost-edge of two minor villages was perhaps not entirely surprising. And yet Heathrow's management seemed to be expecting people, with one sign urging visitors not to spread footwear-borne disease, and another giving the field's postcode should I need to ring 999 in an emergency. It was perhaps best that I didn't quite twig what that might have been referring to as I passed underneath. The track now passed a fenced off area named Orchard Farm, here more directly beneath the flightpath, although on this occasion nothing quite so giant emerged up the runway. And at the Bath Road further signs confirmed that I had indeed been within my rights to pass through, but no motorcycles, and watch out for nesting birds, and horseriders please stick to the bridlepath. Here I waited for a number 81 at London's most westerly bus stop, as yet more aeroplanes screamed over, and promptly made my escape. 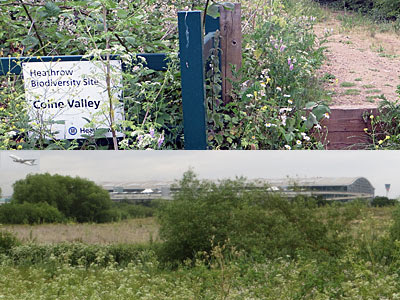 The Heathrow Biodiversity Site (Colne Valley) is one of several spaces watched over by the airport to boost its green credentials. Others include Harmondsworth Moor, just to the north of where I ended up, which is a fascinating place (and can be explored via this Discovering Britain walk). But Heathrow aren't acting as eco-guuardians purely out of the goodness of their hearts. 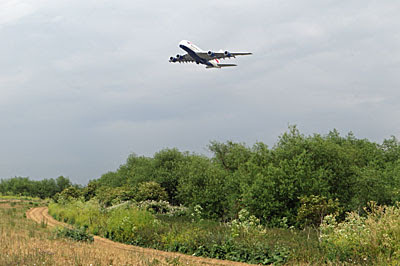 They need wetlands to soak up the risk of flooding around their large expanse of tarmac, and they prefer nobody to live in the liminal areas where planes are loudest and at greatest risk of a crash. But most importantly it helps them to own this land to make any potential expansion of the airport easier. Terminal 6 is pencilled in for the heathland to the west of Terminal 5, and any new NW Third Runway would see Orchard Farm and the northern half of the Heathrow Biodiversity Site vanish beneath an enlarged apron. Should the Davies Commission recommend the wildcard option, the two mile western extension of the existing northern runway, then the whole of the HBS will be unceremoniously sacrificed to the gods of international travel. The Colne will be culverted, the M25 sunk into a tunnel, and the wildlife I saw will have to find somewhere else to be biodiverse. In the meantime I'd recommend a visit to this remote mile of unkempt valley only if you're a fervent plane-spotter, or perhaps if you ever want to get away from it all without actually visiting an airport.